The developers at Tapbots, makers of popular third-party Twitter client Tweetbot, have reassured everyone that their Twitter app isn’t going anywhere anytime soon. 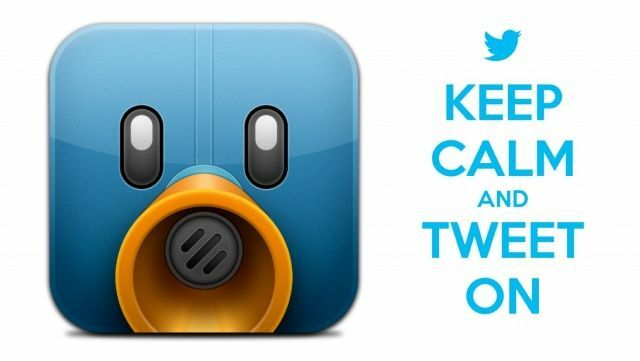 Twitter announced a new set of rules for developers yesterday that could be interpreted as the beginning of the end for third-party Twitter clients like Tweetbot, but Tapbots is confident that their app’s future is secure. Twitter wants developers to focus on making apps that enhance Twitter’s own apps and web experience. Very little room is being left for traditional clients like Tweetbot. The good news is that the clients that already boast huge user bases shouldn’t be in danger of disappearing. There’s been a lot of fear, uncertainty and doubt generated by Twitter’s latest announcement. I wanted to let everyone know that the world isn’t ending, Tweetbot for Mac is coming out soon, Tweetbot for iOS isn’t going anywhere. Tweetbot has more than 100,000 users, so it will be a “few years” until the app’s user base doubles and Twitter has it get involved. And even when that happens, all existing users will be safe. If you have Tweetbot on your iPhone, iPad, and Mac, you count as one user. Tweetbot for Mac was released as a public alpha on July 11th, 2012, and an official beta will be “coming soon,” according to Tapbots.